Here’s another schematic church design that illustrates how to support a vision for ministry with creative church building solutions. In this post, we’re looking specifically at how one church addressed its vision to attract local youth. 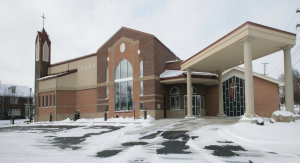 This church building example comes from Grove City Church of the Nazarene in Ohio whose church building is located directly across from a public high school. 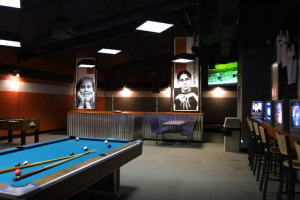 So, their vision for ministry in the community naturally includes reaching out to young people who are seeking a fun and safe place to hang out after school. They want to draw youth in and get them accustomed to thinking of church as a cool place to be. 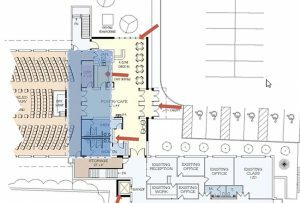 As you can see from this schematic design, we worked with Grove City church leaders to draft a creative solution to a space problem they were having. They had a thriving children’s church program on Sundays and wanted a stage that could incorporate elaborate sets. They also wanted to attract youth from the high school to come hang out during the week, both after school and after ballgames in the evenings. So, we created a two-sided multi-use room that could use the same seating area for two types of events. On the left, we built a stage for children’s church that could accommodate those elaborate sets and allow them to stay up week after week. This permitted the kids to experience a consistent and engaging ministry with no weekly setup and tear down for the adults. On the right side, we built a second stage designed for youth performances with mood lighting and band equipment that also didn’t need to be taken down every weekend either. An arcade was also added (orange arrow in the schematic and pictured left). This multi-use configuration worked well for quite a while. 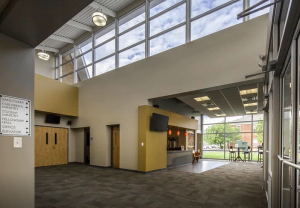 Over time, as the church continued to grow, it built a new space for the children’s ministries and this multi-use room was reconfigured to serve the growing Christian school and the youth ministries. The children’s church platform on the left was torn down and the space was converted into bleachers. 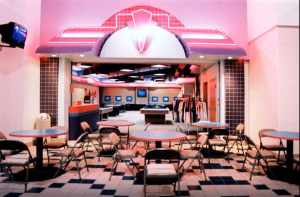 The arcade has also been updated (right). These changes were made to keep the church building current and relevant for teens. It also means that the kids who once attended children’s church in this space still find it to meet their needs a dozen years later. Any church design should be revisited periodically and updated to meet your church’s vision for ministry. Modern and attractive church building spaces will draw people in for the church to minister to. This is one of the underlying themes that drive many of our free i3 webinar presentations. We know that any church building must be periodically reviewed and possibly remodeled to make sure it is still able to support your evolving church vision for ministry in your community. Sign up for our next i3 webinar and join us to learn more. A church design can be as good as a photo in illustrating what’s possible with your church building vision. Once again, we’re examining a church building situation using a schematic design to help illustrate how church leaders refocused their historic church property and created a design that meets their vision and needs for the future. Wayne Street Methodist was worshiping in a 100-year-old church building, but they were having problems. The building’s foundation was crumbling, cracks were appearing, and engineers determined that it would take almost half-a-million dollars to correct the problems and keep their historic church building standing. We met with the church leaders to talk about what they could do and about what other options might be available to them for that amount of money. 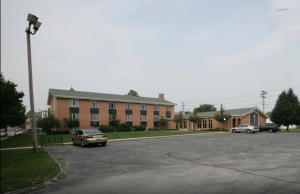 Looking at their property overall, we noted they had an empty field to one side of their main parking lot. 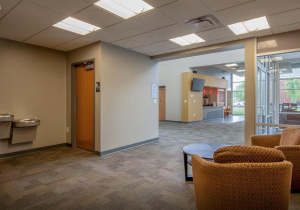 We suggested creating a new worship center church design from scratch and re purposing their existing fellowship hall (pictured)to meet their needs, designing a modern, inviting church building space that incorporated portions of the existing building. 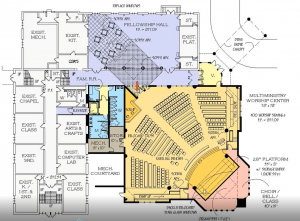 The new and remodeled sections of the Wayne Street church are shown in color on this schematic design. At the top, in purple, is the existing fellowship hall. As you can see in these photos, the older hall was in good shape and serviceable but not exactly welcoming. 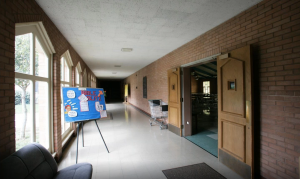 It was also bordered by a hallway that was used to move between the old worship space and the fellowship hall. 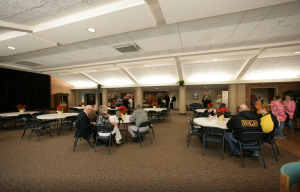 We converted both the hallway and the old fellowship hall into a new multi-ministry room that serves as a foyer in addition to its traditional function as a fellowship hall and dining space. This area is now brighter, warmer, and includes a café that makes good use of the existing kitchen facilities. New restrooms are accessible from the fellowship hall and are right outside the doors to the worship center. In addition to transforming the fellowship hall into a more appealing and functional space, we built a new worship center free from structural concerns and a limiting, historic church design. As you can see in this image, we incorporated some of the stained-glass windows and other features of the former church building to maintain the church’s connection with its history. Finally, we incorporated a new main entry point into the church design. This photo shows how seamlessly the entrance weaves together the new worship center to the left with the existing fellowship hall building on the right. 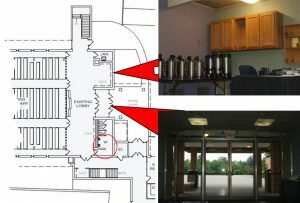 The vestibule leads into either the fellowship gathering space or into the worship center itself. Do you have an aging church building that no longer meets your modern church vision for ministry in your community? There may be more innovative church design possibilities than you can imagine. Contact us today to discuss how we might help transform your church design to meet your needs and sign up for our next i3 webinars to learn more about designing church buildings that work. 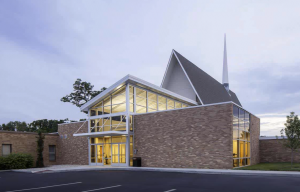 The McKnight Group strongly believes that sharing information about the church design and building process is good stewardship of our time and talent. That’s why we write about it here and present information through our series of free i3 webinars – so that when it’s time to design your new church building or remodel an existing church property, your work as church leaders will be much easier. Here are some questions that were asked in a recent i3 webinar. Sharing these questions and their answers is another way we can help in that process. 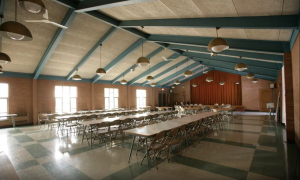 What’s the Cost for an Initial Conversation for a Potential Church Building Project? Depending on where you are in the country and what type of church building project it is, we can often hold an initial meeting and give you our initial opinion at no cost to you. This would involve coming to meet with you, taking a look at your existing church building or potential location, and talking about your church vision and what you hope to do with your new church design. We also may be able to make a few initial recommendations. If there is a cost, it will just be to cover our travel expenses. Some church leaders would like us to do a presentation to the church board or church building committee. If you’re interviewing potential church design and building companies, we’re happy to come and meet with you. During such presentations, we explain our process in great detail: how it works, the fees and time frames, etc. This also is potentially at no cost, depending on the location and project type. Again, if there is a cost, it will just be for our travel expenses. What’s the Average Time Frame for a Church Design Feasibility Study? The short answer is that once we have all the information we need, it will usually take us between one and a half and two months to complete a feasibility study. The information that we need depends on the kind of church design or building project. If you’re trying to decide between two different buildings or properties, we would need the deeds for the existing properties, along with any utility information that may be available. We can research some of that information ourselves, but if you know what utilities (power, water, gas, sewer) are already available on the property, that information is helpful. Also, a survey of that property is also helpful if it’s available. If you’re looking to remodel an existing building, we would need the information above and also the existing drawings. We would also like the chance to come visit, to see the site and take photographs. Once we have gathered all that information, we can begin our process. From that point, we can usually complete your feasibility study in one and a half or two months. As you can see, our i3 webinars give you an excellent opportunity to get answers to your church design, remodeling, and building questions. “i3” stands for ideas, insights, and innovations, which are what we provide in each webinar. This is why we encourage you to sign up; there’s always more to learn! We’ve seen some interesting stumbles and near-misses in our near 50 years of church building. As a result, we know numerous mistakes to avoid in church design and building projects. Here are three of the pitfall possibilities that can take place early in your church building project. Some church leaders are certain that they know exactly what they want right from the beginning. While it’s great to be excited and inspired by your idea, it’s also smart to talk it through and be open to further feedback from others in — and beyond — your church, and even get additional input from church building professionals. We find that, often, the final version of any church design is significantly different from the original vision. This is one case where input from church staff, leadership, ministry leaders, and even community leaders can improve upon your initial church design. By thinking broadly and seeking other ideas, one church building can meet the needs and expand the vision of multiple ministries in your church and community. Another pitfall is not thinking about various groups as a whole. If your church design creates a separate space for each ministry, you will design a much larger, more expensive campus than you really need. Instead, look at the ways to share space such as with groups that meet at different times and need similar amenities, be it kitchen facilities or certain types of audio-visual resources. Admittedly, there are exceptions to every rule. There are some spaces that will be more dedicated than others. You may, for example, want your youth to take ownership of their space so they feel like they can call it their own. Another pitfall is not thinking about how your church design will — or won’t — appeal to the groups of people you are trying to attract to your new church building. If you design and furnish a church building without considering the finishes and furnishings they will like, you could find that they walk in the door and walk right back out again. Perhaps you are trying to attract young families. An interior design focused on fancy floral arrangements on low tables, delicately upholstered chairs, and expensive artwork on the walls will likely be intimidating as parents worry that they must spend their time keeping their kids from knocking things over and messing up the fancy furnishings. However, if they walk in and see stylish, modern furniture and a children’s play area next to a café, these families are going to feel right at home and stick around. Clearly, there are many considerations involved in crafting the best church design for your particular vision. It’s why we offer our free i3 webinars, which give you additional perspectives and illustrate solutions that might not have come to mind. We invite you to sign up today for our next i3 webinar and learn all you can about crafting the best church design possible for your situation. When finances are tight, thinking small is a natural tendency. But thinking small when it comes to church design isn’t necessary, or even always the most cost-effective way to go. When it comes to a new or renovated church building, it’s usually smarter to dream big, but build in phases. With nearly 50 years of experience in supporting church leaders with the design and construction of church buildings, we can confidently say that few churches have the finances in place that allow them to implement everything that they want right away. Churches relocating from an existing church building or rental facility or starting a new church design from scratch find this especially true. These projects are expensive because all the infrastructure must also be paid for—everything from property and utilities to paving parking lots and installing landscaping. Not many churches can afford to do all this and have the church building they dream of all at once. Phased implementation is the solution to dreaming big without breaking the bank. The lack of available money is no reason to curtail your vision for ministry in your community. Working with church design professionals can help you think creatively about how to start with what you can afford and, as your number of attendees grows (and more funds become available), expand your church campus. Building the perfect church campus over time usually means that ministries in your church community will share space in the first phases of construction. 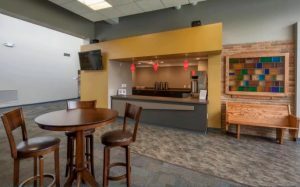 The McKnight Group can design multi-use spaces that can be scheduled with sharing in mind, which will allow each ministry to grow. Eventually, that growth will provide funds to expand shared spaces into single purpose spaces in future phases of your church design. Don’t be afraid to dream big! But recognize that getting there may take a while. Just as faith is a journey, not a sprint, the journey toward your dream church building complex also can be accomplished with time and patience. We are happy to talk with you about your big dream for ministry in your community and to help you figure out what phases would work for your unique situation. Give us a call at 800-625-6448 or send us an email. We also encourage you to sign up for our latest free i3 webinars to learn more about the church design and building process. 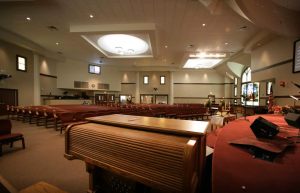 Are you considering a new church building or a remodeling project? The entire process doesn’t have to overwhelm you. You see, The McKnight Group’s expertise extends well beyond construction, and construction of churches for that matter. Here at The McKnight Group, we practice what we preach. The McKnight Group’s Leaders are involved with church and ministry leadership boards, and participate in leading small groups and teaching classes along with volunteering for other ministries. Many of our employees are Christ Followers who are active in their church’s ministries. We not only have a great wealth of professional knowledge but also personal experience. We understand your specific needs as a church, which is one reason why we encourage involving church design professionals as early as possible in your church building process. Feasibility studies—an initial assessment of options—is a very good way to bring in church design professionals early on. For example, is your church leadership deciding whether to stay in your current location and remodel an existing church building, or construct a new facility in a different location? Feasibility studies sketch out possibilities and help you decide between them. Perhaps you’ve decided that you need to move, maybe you’re renting space and it’s become too small, or your church building is old and not suited to your current vision. You’ve looked around and now you’re deciding between two different properties. A feasibility study will help you figure out the pros and cons of each. Feasibility studies do more than sketch a possible church design for your review and modification. Yes, we can layout plans for each option that you’re considering, but we also investigate things like zoning issues and utility availability, as well as purchase price, and weigh all those issues to help you decide the best option. Church professionals often scrap many initial drafts of a church design. Plus, back-of-the-napkin sketches don’t give you a realistic sense of possibilities anyway, which is why we recommend calling us in early to talk about your vision. Remember: we’re also members of and leaders in our churches and we understand churches. Are you ready to take that first step? Give us a call. Sign up for our upcoming free i3 webinars that provide valuable, up-to-date information on many church building and remodeling ideas, insights, and innovations that can impact what you might achieve with a professional church design. When it comes to a church building project you need to take a realistic look at your financial situation and develop a good ballpark estimate of your church building costs before you ever clear the land or lay the foundation. However, the cost of construction may not be what you think it is. Occasionally, although less often than in prior decades, we get churches calling us that expect to be able to complete a new church building for between $50 and $80 per square foot. They think that, because inflation has been so low in recent years, these are still reasonable numbers—but they are not, especially for new construction. If you’re hoping to complete a small church remodeling project, the high end of those kind of numbers might be possible, but certainly not for a new church building. In 2010, the average cost to construct a new church building hovered near $100 per square foot, but inflation really began to kick in during 2017 and 2018. Today, when church leaders are beginning to discuss a new church building project, we suggest that they budget between $120 and $150 per square foot—and that is just for the church building itself. However, there’s much more to a church project than the building. Outdoors, you need to factor in site development (the cost to prepare the land for the building itself), parking lots, sidewalks, utilities, and landscaping. Indoors, you need to count the cost for flooring, paint, and furniture; appliances; lighting, sound, WiFi, and audiovisuals (and don’t forget the wiring! ); and, of course, keys to your new church building. For us to truly deliver a turnkey church building project, we recommend that churches budget between $210 and $275 per square foot. Don’t despair. There are ways to raise funds for your church new construction project. Capital campaigns continue to be the primary method for raising church building funds. They can be very successful, especially if you are willing to engage a professional consultant that specializes in raising funds for church projects. There are numerous companies around the country that do this kind of work. Here at The McKnight Group, we know them all. This means we can recommend a company that will be the right choice, the right fit, for your church and your vision for ministry. We strongly recommend that you do not go it alone. Building or remodeling a church is a team effort. Engaging experienced consultants for both the fundraising and the church building project itself is always good stewardship. This is also why we share so much of our own hard-earned wisdom in our free i3 webinars. Let us become part of your team. Sign up today for our next i3 webinar.